Yesterday, former SEC Chair Arthur Levitt penned an OpEd for the Wall Street Journal, effectively telling Senator Elizabeth Warren to stop criticizing Mary Jo White in public. White is the current Chair of the SEC that Senator Warren publicly asked President Obama to fire this month for her bad leadership. Senator Warren is a genuine champion of the investing public and understands how the SEC has become a lapdog to Wall Street under White’s inept leadership. Levitt is part of the Bill Clinton machine that de-regulated Wall Street and turned it into a massive looting racket in the 1990s through today. It’s important to take note of Levitt’s effort to muzzle Warren in the pages of the Wall Street Journal. Expect to see more of this coming from a lot more of Wall Street’s cronies. 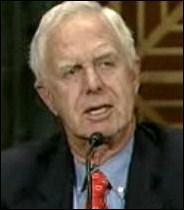 Arthur Levitt was appointed as SEC Chair by President Bill Clinton in 1993. Levitt served until 2001, making him the longest serving SEC Chair. Levitt had previously been Sandy Weill’s business partner in a Wall Street brokerage firm. In 1998, when Weill wanted to create Citigroup by merging his Travelers Group, which owned an insurance company, brokerage firm and investment bank, with Citibank, an insured depository bank – an illegal merger at the time under the Glass-Steagall Act — Levitt and his other cronies in the Bill Clinton administration eagerly got the ball rolling. During his long tenure, Levitt presided over the serial looting of the public by Wall Street. Levitt was in charge when two university professors discovered that the Nasdaq stock market had been fleecing investors for more than a decade in an illegal price-fixing scheme. Levitt was in charge when Wall Street’s fraudulent research and IPO pump and dump schemes led to the great tech bubble crash, wiping away $4 trillion in market value. Levitt was there when JPMorgan and Citigroup helped Enron cook its books. So when Levitt tells readers of the Wall Street Journal that “Mary Jo White has been a firm, thoughtful SEC chairman who, through speeches and a carefully chosen agenda, has made herself a capable steward of an essential agency,” one should take it with a grain of salt. Mary Jo White should never have been confirmed by the Senate as SEC Chair because both she and her husband, at their two respective law firms, had represented every major Wall Street bank. (Under Federal law, the conflicts of the spouse become the conflicts of the Federal regulatory head.) Levitt should never have become SEC Chair because of his close working ties to Wall Street. The Wall Street Journal is undermining its own credibility and further undermining the culture on Wall Street by promoting efforts to silence Senator Warren.